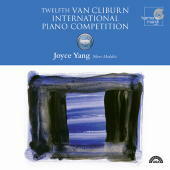 First held in 1962, the Van Cliburn International Piano Competition has established itself as a joyous festival dedicated to the discovery and celebration of the world's finest young pianists. Every four years, the Van Cliburn Foundation offers the opportunity for a select group of outstanding musicians to showcase their talent while challenging themselves to reach new standards of artistic excellence. For more information on this CD visit the Harmonia Mundi website.